Cambridge International A Level is an Advanced Level General Certificate of Education (GCE) administered by Cambridge Assessment International Examinations (CAIE), an examination board under Cambridge Assessment. 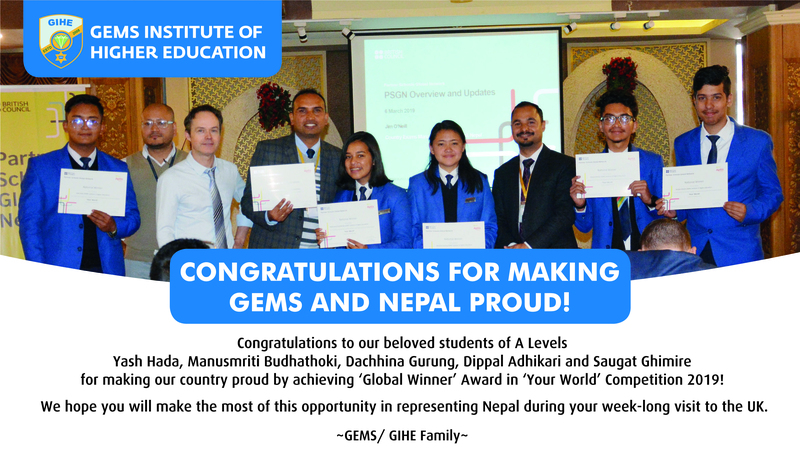 The A Level, equivalent to the Higher Secondary level (Plus 2) education of Nepal, is a course that is divided into two parts; the Advance Subsidiary (AS or also called A-1) that is expected to be completed in the first year, and the second part of the course, commonly referred to as the Advanced (A or A-2 ) Level, is completed by the end of the second year. Credits ‘A’ refers to a full two-year course that carries 1.0 credit, and ‘AS’ refers to a one-year course, which carries 0.5 credit. The minimum requirement for A-Level qualification is 3.5 credits which mean that students must take at least three ‘A’ subjects alongside at least one ‘AS’ subject in order to qualify for admission to reputed universities. Students should have passed the Secondary Education Examination (SEE) or equivalent examination in order to be eligible for A Level study. Students with at least GPA 2.8 or Grade aggregating B in the SEE qualifying /Class X annual examinations are eligible to apply for A Level both in Science and Non-Science streams. Admission is granted to shortlisted students after entrance exam and interview on condition that a copy of the SEE mark sheet along with the character certificate is submitted to the college office within the first week from the date of the publication of the SEE results, failing which admission will be cancelled, and the amount deposited during admission will be forfeited. Copies of the following documents must be submitted at the time of submission of the completed application form. Mark sheet of SEE qualifying / Class X internal examination of the school. Certificates of awards or scholarships earned at school, if any. Migration Certificate (Applicable for the students from boards other than SEE). We provide students with a stimulating environment for their enriched learning. At GIHE, students not only gain academic knowledge and skills but they also develop their confidence through continuous assessments of their performance. A maximum of 25 students are kept in a class so as to enable the faculty to give students individual attention and care. Students are encouraged to enquire and participate in discussion, and are assessed regularly through unit tests, monthly and terminal examinations. Generally, three unit tests and three terminal examinations are given in a year. In addition, project work, presentations, assignments, etc. are given to students on a regular basis to make them responsible, reflective, innovative and engaged. Students are required to obtain a minimum of 40 percent marks in all the subjects in the overall internal assessment to qualify for appearing in the board examinations or else they will have to reappear in the failed subjects. Students are also frequently taken on field visits to gain hands-on experience in different subjects. From time to time professionals from different fields such as medicine, engineering, applied science, management, etc. are invited to interact with the students and talk about their professions, to enable students to make a decision regarding their future career.